We have chosen to review Texas Pacific Land Trust (TPL) because its shares offer a unique way to gain exposure to the Permian Basin, the “sweet spot” of the oil business today. At current prices, the Permian Basin has no competition for producing oil, except for the Middle East where production is controlled by government budgets and not costs. Texas Pacific Land Trust has the good fortune of owning vast amounts of land and mineral rights in arguably the best oil producing area ever, all at no cost to them and their shareholders. Texas Pacific Land Trust was organized under a Declaration of Trust, dated February 1, 1888. It was to receive and hold title to extensive tracts of land in the State of Texas, previously the property of the Texas and Pacific Railway Company, and to issue transferable Certificates of Proprietary Interest prorate to the original holders of certain debt securities of the Texas and Pacific Railway Company. The Trust manages land, including royalty interests, for the benefit of its owners. The Trust’s income is derived primarily from oil and gas royalties, easements and sundry income, land sales, grazing and other leases, interest on notes receivable, and interest on investments. Some version of this description of the Trust explains their day-to-day affairs. Even a cursory examination of operations, however, will reveal that there is far more to this interesting story and that the more complete version is an intriguing historical story and a compelling investment opportunity. As the name suggests, the Trust started as a railroad, one of many built in the 1800’s to link the east and west coasts of America. As with all the companies that were awarded the rights to build the lines, the government, (in the case of TPL it was the State of Texas), gave land to the enterprises in a checkerboard fashion which could be used as collateral to raise money to build the railroads. Many of the companies, such as the Texas and Pacific Railway, went broke. Some more than once. But the railroads were built. After the sale of one finished section of the Texas and Pacific line to what is now the Southern Pacific Railroad, the company filed bankruptcy and became a trust. It retained large land holdings in West Texas to be managed and liquidated to repay debt holders. Debt holders exchanged debt for Trust Certificates and holders became shareholders. All debts were converted so the Trust has no debt obligations. Looking at the company and the Trust from today’s perspective, one could add two key points to the official Trust description. The first is that the vast majority of the remaining land is in what happens to be oil producing land in the Permian Basin. 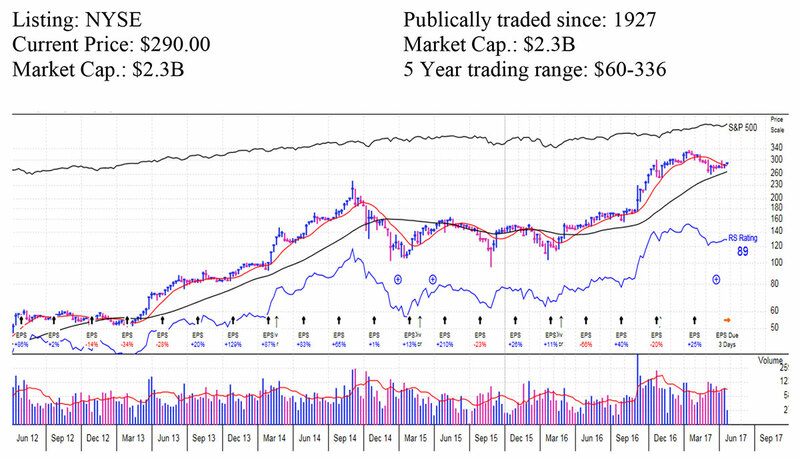 Secondly, most of the Trust’s revenue after taxes and expenses is used to repurchase shares on the open market. This concept has been deemed by the Trustees over the years to be the most efficient way to return money to shareholders in keeping with the original intentions of the Trust Declaration of 1888. It has served shareholders well as this program has retired an average of 2.5% of outstanding shares per year for many years and the price of the remaining shares have appreciated greatly over time. Corporation today and are probably the second largest holding of any company in the Permian. Had those mineral rights been retained by the Trust, it would be one of the largest oil companies in the world today. Fortunately, Texas Pacific Land Trust retained some of their original mineral rights through the conveyance agreement of the spun-off oil company. So today, in addition to the surface ownership of about 900,000 acres of land, TPL still owns royalty interests on about half that land, consisting mostly of a 1/16 mineral interest. Some of those rights are on land not owned by the Trust. 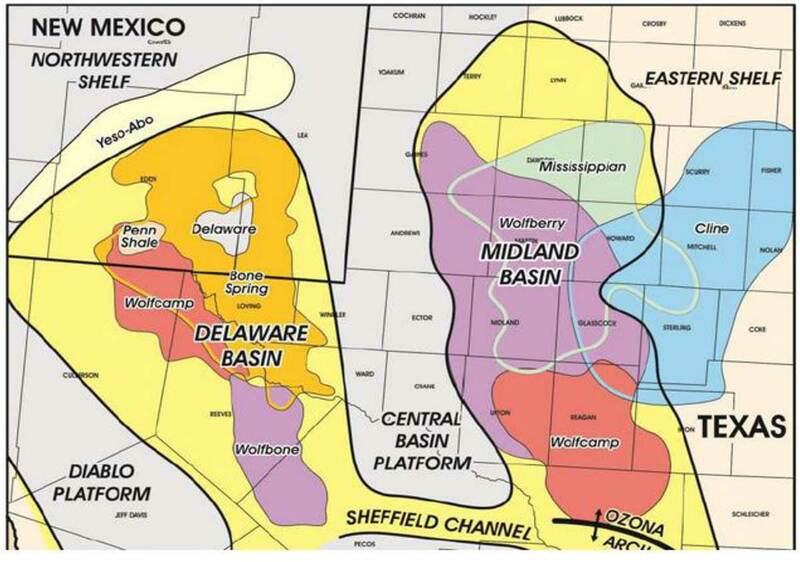 Moreover, for anyone who owns shares today or is contemplating investing, the majority of those rights are in the so-called fairway of the Delaware Basin side of the Permian. It is currently the hottest oil property in the world. The Permian Basin is important now to the oil industry because it is geographically vast, over ten million acres in size in the two main basins, and because there are multiple oil and gas bearing layers stacked on top of each other, as many as fourteen zones. The total column of productive sediment is as much as 8000 feet thick. By comparison, the prolific Eagle Ford Shale in south Texas rarely exceeds 400 feet in thickness. 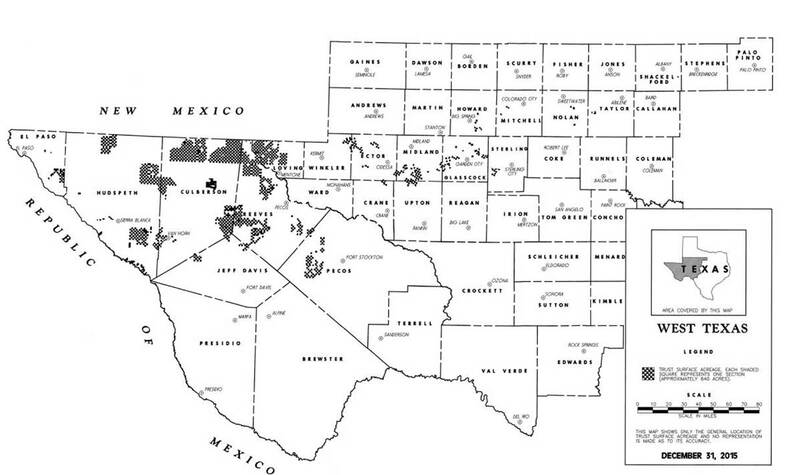 For a visual picture, the following map shows the general boundaries of the Permian Basin. The entire basin is productive, some areas more than others. The main appeal of the Permian Basin is the size and scope of proven reserves combined with the presence of abundant take-away capacity already in place and the relative ease of building more new capacity. The lifting costs for new drilling are among the lowest, if not the lowest, in the world outside the Middle East and the stacked nature of the play gives the region immense staying power. 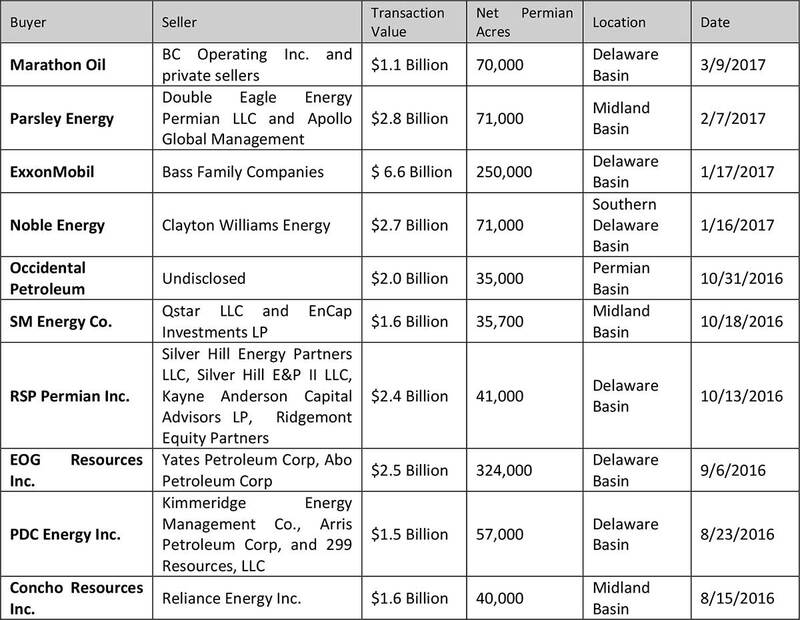 We have listed these reasons and the interested parties in previous letters and publications, but below are some names and the sizes of their respective transactions focused in the Permian in the last year. This selection of transactions demonstrates the momentum taking place in the region. Companies such as Anadarko Petroleum, a $40 billion company, plan to spend as much as 70% of their budget for the next several years in the Permian. There are other large companies that have similar plans. Exxon, for example, plans to expend as much as 40% of their future budget in the Permian after their recent large purchase of additional Permian leases. Tens of billions of dollars will be spent in the area over the next few years as the only way to get a return on that capital is to drill wells and build infrastructure! revenue on the horizon through the sale of subsurface water for drilling. Water rights are retained by the surface owner and TPL is one of the biggest, if not the biggest in the area. All available non-potable water will be needed to keep pace with fracking in the future. Since TPL owns a lot of water, its shareholders could soon see another source of revenues. 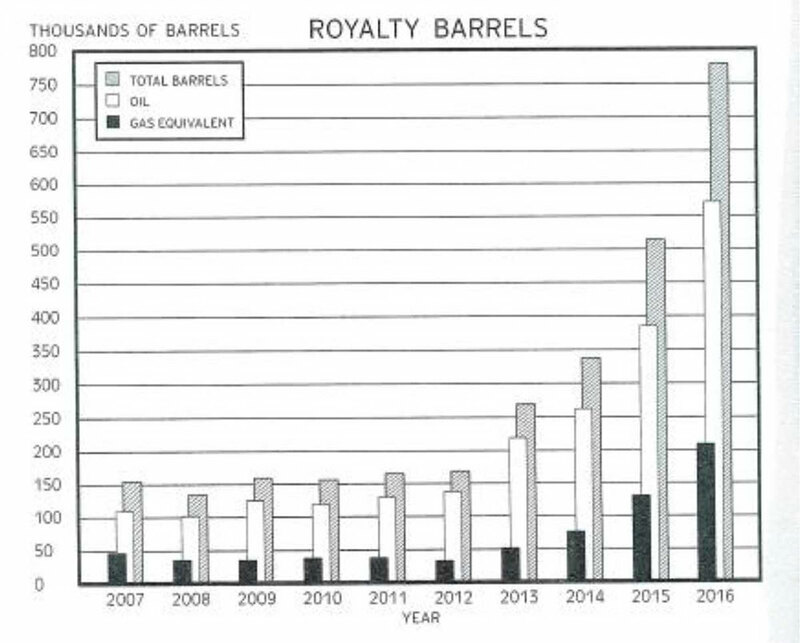 There are strong indications that royalty barrel increases will continue apace this year and likely for years to come. The percentage increases for 2015 and 2016 at TPL have been 52% and 53% respectively. Based on the increased number of wells drilled on TPL land last year and the continued pace of drilling, 2017 could be another good year of volume growth, and prices are higher. The average price of oil received on 2016 oil for TPL was just $38/bbl. The current price is about 32% higher. If that price holds and volumes increase this year at close to the same pace as previous years, TPL revenues could be double that of 2016. According to Reuters, another factor suggesting future TPL revenue is that almost half of the wells drilled in the Permian over the last year were not fully completed. One obvious reason for this could be that drilling is presently outpacing take-away capacity. We have personally observed lots of gas being flared and numerous oil and water trucks on the roads in the Delaware Basin. Because many leases contain drilling provisions in order to hold the land, many wells simply are not completed as fast as they are drilled. The rigs and crews have to move on. So much infrastructure is needed that it is hard to keep up. Over time however, flared gas will be collected, oil and liquids will be piped out and uncompleted wells will be completed. Specifically relating to TPL, it appears that many of the wells reported as drilled in the past two years are not yet completed or else production numbers would be far higher. As they are completed, the wells should prove to be a source of stronger volume and revenue increases. Many of the current operators in the Delaware Basin will soon change the nature of their drilling programs to concerted drilling from pads designed to drill multiple wells as quickly as possible. This is a shift from exploration and evaluation to production. It appears that this process could start in the second half of 2017 and pick up the pace over the next several years. We believe the pace of drilling by most of the big operators in the Permian will accelerate soon if oil prices are flat. We also think that the number of wells drilled on TPL may double as early as this year and uncompleted wells will come online. All of this is at no extra cost to shareholders of TPL. We think all these factors make Texas Pacific Land Trust the most economically efficient company in the Permian Basin.